Features: Dual disc juicer - Create delicious and healthy Froojie? drinks - 100% fruit juice smoothies Froojie? disc - retains the fibre rich pulp in juices. Also ideal for making dips and gelatos Juice disc - separates the pulp from the juice. Ideal for healthy juices and cocktails 84mm wide feed chute - for juicing whole fruit and vegetables Variable speed - 5 speed control helps maximise juice extraction LCD sreen with juicing speed guide Powerful 1300 watt Extra large 3 litre pulp container Large 1.2 litre juice jug with froth separator Combining premium stainless steel and die cast for durability Extra sharp juicing disc with titatinium reinforced cutting blades Stainless steel Froojie? disc and insert ensures maximum yield from soft fruit and vegetables Designed in Australia. 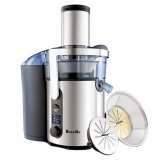 The Breville iKon Froojie BJE520 Juicer was added to the Juicers category in June 2016. 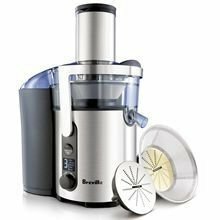 The lowest price GetPrice has found for the Breville iKon Froojie BJE520 Juicer in Australia is $252.47 from Kitchen Warehouse. Other merchants who stock it are Kitchen Warehouse, House, Appliances Online.